The TriflexTM II is a 1000 Watt three piece, two-channel sound system, already tweaked and ready to go for sound reinforcement, DJ gigs, and various music playback duties. Consisting of a shared Subwoofer cabinet and a pair of Satellite speakers, the system has been pre-engineered for a balanced sound and a crisp, punchy presentation. The three-way effective performance that the system is capable of provides a clear sound at high output levels, with plenty of punchy bass. 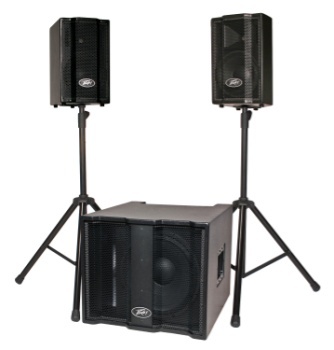 1000W Active Two-Channel Three-piece Speaker System. One shared Subwoofer cabinet which houses the inputs and power amps. Two two-way Satellite speakers with speaker pole stand adaptors. Subwoofer has 15" woofer, with 500W peak available power. Satellite speakers have 10" woofer, RX 14 1.4" compression driver. 250W peak available power to each Satellite speaker. Peavey's exclusive DDTTM compression on the Satellite power amps. System comes with two 15 foot speaker cables. Protective slipcover with cable storage pockets and built-in Velcro retaining straps. Heavy-duty locking casters on Subwoofer cabinet for transport of system. Satellite speakers nest on top of the Subwoofer, help ease transport. Weight Unpacked: 159.83 lb(72.5 kg). Weight Packed: 199.52 lb(90.5 kg). Width Packed: 30.5"(77.47 cm). Height Packed: 53"(134.62 cm). Depth Packed: 24.5"(62.23 cm).